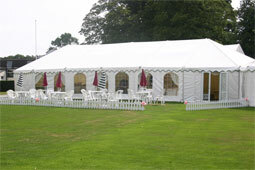 A marquee is the perfect venue for a wedding reception, providing a uniquely private atmosphere at a location of your choice. 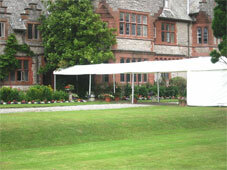 Choosing a marquee venue frees you from the constraints of a fixed function suite. You have limitless decorative possibilities, can arrange a home wedding without using your house, and best of all, the party can go on all night! From traditional decor to something a little more unconventional, your marquee can be decorated to your style and specification. 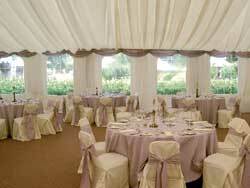 We can transform the marquee to suit your theme, giving your wedding a truly personal touch. 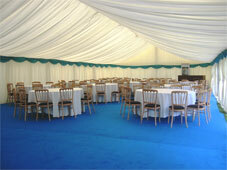 We take particular care when planning your wedding marquee to ensure it is appropriate to accommodate your guest numbers, seating arrangements, catering facilities and other equipment. We understand the most important day of your life should be perfect in every way possible. We play our part professionally and efficiently, ensuring your big day meets your expectations. And, if you wish, we can do all the hard work. Our full wedding co-ordination service takes care of the catering, flowers, decorations, musicians, fireworks, stationery, and more. All you have to do is enjoy your special day.